My most recent production for Windmar Music in Vista, California is the debut album by a genuinely talented singer / songwriter who reports to work each day at the Scripps, La Jolla Intensive Care Unit, Mr. Rod Salaysay. 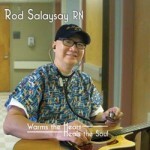 Rod discovered he could share his music at the bedside of his patients and offer them comfort and hope though songs he wrote about them and others he had cared for. Peg Windrum & I had the pleasure of producing, engineering and co-writing Rod’s album. I had the honor and the fun of playing many different instruments on the record. I still call them records, always will. Track 01. "Be A Nurse"
Track 02. "The Promise of Tomorrow"